Bryant Park Blog: Where Did All The Birds Go? Summer is here. That means a range of experiences in NYC, from days spent at the beach to the smell of hot garbage. Some people revel in longer days and warm nights and all of the fun summer events the city has to offer, while others escape to Long Island or the Catskills if they can. Birds have a similar range of adaptations. The vast majority head to their country homes to raise young in areas with more extensive forests and fields. 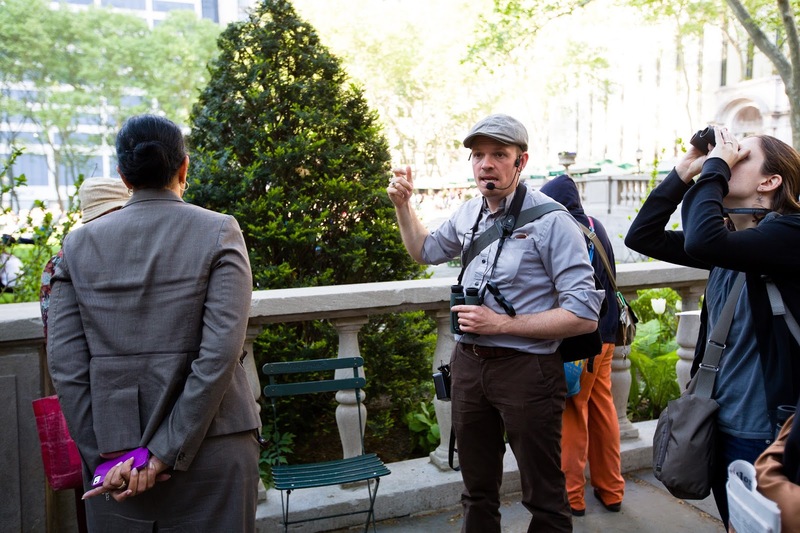 While over 120 species of birds have been seen in Bryant Park over the years, as far as I know, only three (none of them native) remain to nest in the park: Rock Pigeons, European Starlings, and House Sparrows. These three are the big three of city birds, those that are most supremely adapted to the densest urban environments. 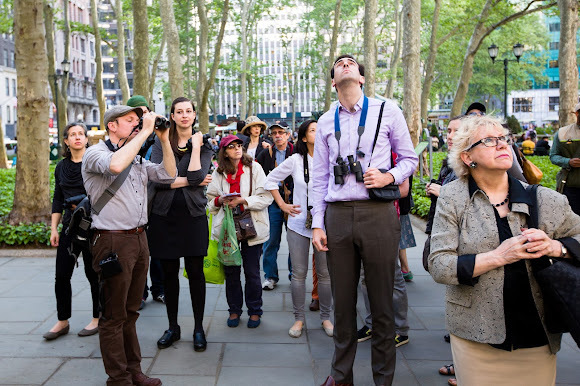 If you were in Bryant Park in the summertime and were to cast your eyes skyward, you might catch a glimpse of a Peregrine Falcon or a Herring Gull flying overhead, which might bring your count up to 5 or 6 species. But overall, it's slim pickings. This is why we have a hiatus from our Bryant Park Bird Walks during the summer months: there's very little to see! Where did all the birds go? The vast majority of birds seen in NYC are simply migrating through the area. Some winter here (such as the abundant White-throated Sparrows that spend October to May in Bryant Park), but still depart to head north to raise young. Some species, such as the abundant Ovenbirds I profiled in my last post, breed as close as 20 or 30 miles outside the city, but still are rarely found nesting within NYC. Gabriel Willow leads a tour earlier this summer. Even in the city's larger parks such as Central Park or Prospect Park, only about 25-35 species of birds have been recorded breeding (which is synonymous with remaining over the summer). This is contrasted to the 250+ species those parks have on their total bird lists. So only about 10% of bird species that can be found in NYC remain here to sing, court, build nests, and raise young. It seems that for most birds, the motto is "New York City is a nice place to visit, but you wouldn't want to raise kids there." This is presumably due to the relative lack of habitat. Some species that migrate through our area breed on arctic tundra, or in boreal forest, or on mountaintops, and the appropriate habitat simply isn't found in our area. Others breed in deciduous forests or grasslands of the type that can be found at our latitude, but there just isn't enough of that habitat here to entice them to stay. Many of these species can be found within 50 miles or less of the city. It's always a bit mysterious to me which species choose to remain and which don't: why are Baltimore Orioles common breeders in NYC parks and even street trees, but not Indigo Buntings? Why do Warbling Vireos nest in the city commonly, but Yellow-throated Vireos do not? It all must come down to some subtle differences in habitat requirements, whether tree species, food, or some other factors. Birders scan the tree canopy for critters. These questions are worth taking a closer look at. As increasingly large swaths of our country and the world are urbanized, some birds will adapt, and others won't fare as well. Some species have more specific habitat requirements, particularly for nesting, and prefer larger, undisturbed tracts of forests or fields. These species will be the hardest-hit by habitat loss and fragmentation. We are already seeing declines in certain species, such as a lovely bird called the Bobolink, which prefers large meadows to nest in. Their population has declined precipitously in recent decades. Whether this is because of habitat loss in their South American wintering grounds, or farmland in the northeast, or declines in their insect prey from pesticide use, is unknown. On a brighter note, there is a surprising amount of habitat preserved near NYC. A network of State Parks, National Forests, and other protected lands exists across the state. These refuges are part of the reason we see such an abundance and diversity of birds passing through our area during the migratory season (as well as the existence of ancient flyways that the birds follow through our region). Soon, they will finish raising their young, and both the adult and the immature birds will heed the ancient pull to fly south as the days grow shorter and cooler. The young birds, migrating for the first time, will follow their instincts and fly along a large river, or along the coastline, and will encounter a dense and unfamiliar landscape of concrete, glass, and steel. They will look for islands of green and blue, and land by the thousands in our city parks, seeking shelter, food, and rest. And we'll be there to greet them, as our Fall Migration walk series resumes on September 12.